Sometime I can get kind of lazy and really can't be bother to cook. Trying to juggle between a working life and social life is hard enough as it is, so there are times that I just want simple and easy dishes that will not only be delicious but also take almost no time to prepare and cook. I don't want any tedious chopping or laborious long hours of simmering. Yet, I want to have a dish that taste like I have made a bit of an effort. And this is one of those quick and easy dish. Be it there's no meat or any other visible protein in it, but who is to say a vegetarian meal a day wouldn't be enough to keep the hunger away. This is a thoroughly satisfying dish. The magic to this is the fermented bean curd or furu / 腐乳 as it is known in Chinese. Not the most well known Asian ingredient around. Other than serving this with some plain congee (rice porridge) for breakfast, it is also used as marinade or as condiment in stir fried dishes sometime. It has an intense richness that betrayed its innocent pale appearance. 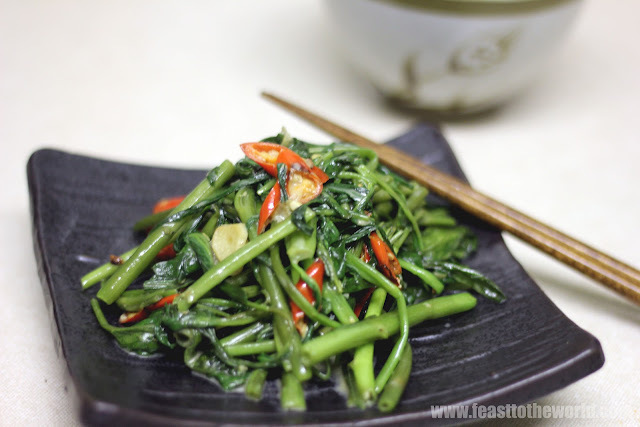 It is lightly salty and has a mild underlying sweetness that complement the crunchy green-tasting kangkung (also known as water spinach or morning glory, last appeared on Sambal kangkung) beautifully. All you need with this easy-peasy dish is a bowl of warm steamed rice and your dinner dilemma is solved. Well, mine did anyway. Heat up the oil over high heat until smoking. add the garlic and stir-fry for 30 seconds before adding the chilli and bean curd, fry for another 2-3 minutes, until fragrant. 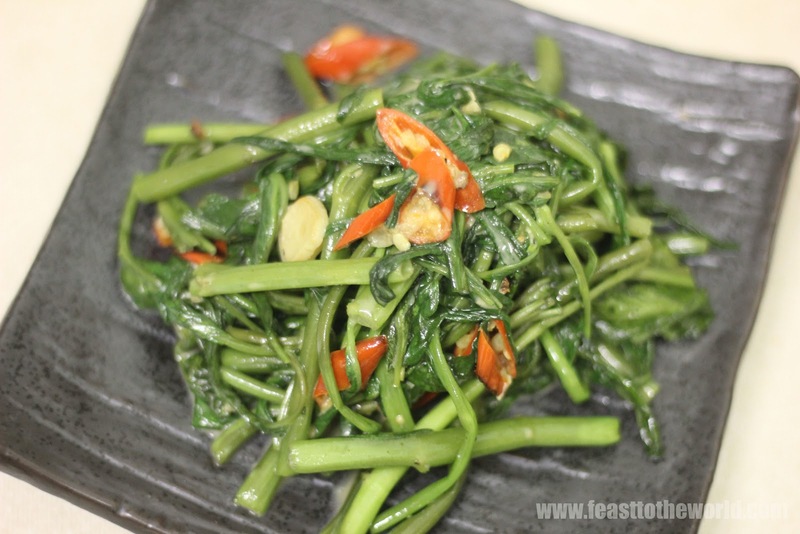 Add the kangkung and toss to fry for a minute before adding the sugar, salt to taste. Finally, add the sesame oil and give one last toss before removing from heat. Serve immediately. 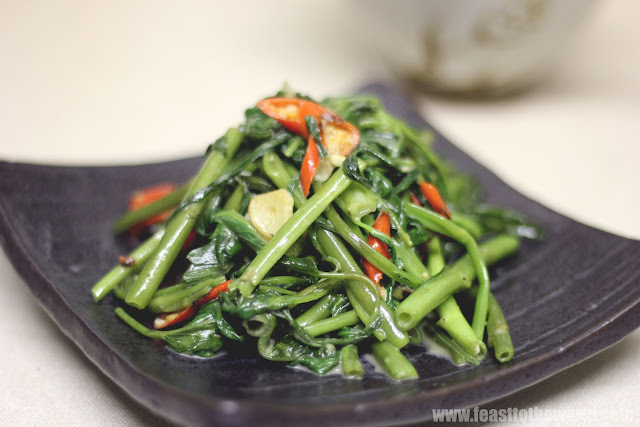 Where can I get kangkong in ldn!!! You should be able to get hold of them from chinatown and also some supermarket have started stocking them too.